The Apple Vanilla Whole Wheat Pancakes Recipe is a super simple and quick breakfast that is packed goodness of whole wheat flour, grated apples and coupled with vanilla extract and eggs making the pancakes filling and nutritious. Serve the Apple Vanilla Whole Wheat Pancakes along with more apples drizzled with honey or any other seasonal fruit of your choice. To begin making the Apple Vanilla Whole Wheat Pancakes Recipe, stir together wheat flour, baking powder, and salt. Heat skillet to medium heat. Pour a ladle full of the apple vanilla pancake mixture on the skillet. Do not spread the mixture on the skillet, once pour it on a hot skillet it creates on its own a boundary point. 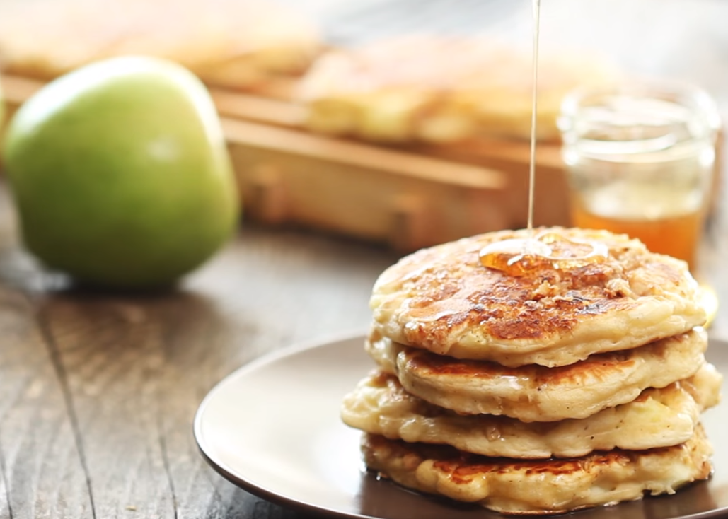 Serve the Apple Vanilla Whole Wheat Pancakes with more apples or other fruits drizzled with honey or any other seasonal fruit of your choice.